A change of temperature in a gas undergoing Joule-Thomson expansion. Also known as Joule-Kelvin effect. the change in temperature experienced by a gas as it slowly passes at constant pressure drop through a throttle—.a local obstacle to gas flow (a capillary, valve, or porous plug placed in a tube in the path of flow). The flow of gas through the throttle (throttling) should take place without heat exchange between the gas and the surrounding medium (adiabatically). The Joule-Thomson effect was discovered and studied by the British physicists J. Joule and W. Thomson in 1852-62. In their experiments they measured the temperatures at two successive sections of a continuous and steady gas flow (before and after throttling, Figure 1). Figure 1 Diagram of Joule-Thomson’s experiment. The considerable gas friction in the throttle (a cotton plug with fine pores) reduced the rate of gas flow to an insignificant value, thus during throttling the kinetic energy was very small and remained virtually unchanged. As a result of the low thermal conductivity of the tube’s walls and throttle, heat exchange between the gas and the external medium was nonexistent. With a throttling pressure drop Δp = pl - p2, equal to 1 atmosphere (1.01 x 105 newtons/m2), the temperature difference ΔT = T2 -T1 for air measured -0.25°C (the experiment was conducted at room temperature). Under the same conditions, the corresponding values of AT for carbon dioxide and hydrogen were -1.25°C and +0.02C. 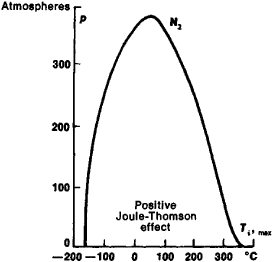 The Joule-Thomson effect is called positive if the gas cools during throttling (ΔT <0) and negative if it heats up. According to the molecular-kinetic theory of the structure of matter, the Joule-Thomson effect shows the presence of intermolecular interaction forces in a gas (Joule and Thomson’s experiments attempted to detect these). In fact, with the mutual attraction of molecules, the internal energy U of a gas includes both the kinetic energy of the molecules and the potential energy of their interaction. Expansion of a gas under conditions of energy conservation does not change its internal energy, but leads to an increase in the potential energy of the interaction of molecules (since the distances between them increase) at the expense of kinetic energy. As a result, the thermal motion of the molecules slows down, and the temperature of the expanding gas will decrease. In reality, the processes leading to the Joule-Thomson effect are more complex, since the gas is not isolated with respect to energy from the external medium. It does external work (the successive portions of gas, to the right of the throttle, compress the previous ones), and to the left of the throttle the forces of external pressure work on the gas (maintaining the steady flow). This is taken into account when drawing up the energy balance in the Joule-Thomson experiments. The work of pushing through the throttle a portion of gas occupying volume Vl before the throttle is p1Vl. The same portion of gas occupying volume V2 after the throttle does work p2V2. The resulting external work A = plVl - p2V2 done on the gas can be either positive or negative. Under adiabatic conditions it can lead only to a change in the internal energy of the gas: A = U2 - U2. Thus, ΔT can be found knowing the equation of state of a gas and the expression for U. The value and sign of the Joule-Thomson effect are determined by the ratio of the work of the gas to the work of the forces of external pressure as well as by the properties of the gas itself, in particular by the size of the molecules. In the case of an ideal gas whose molecules are regarded as noninteracting material points, the Joule-Thomson effect is equal to zero. Depending on the throttling conditions, one and the same gas can heat up or cool down. The temperature at which (for a given pressure) the difference ΔT on passing through zero value changes its sign is called the Joule-Thomson inversion temperature. Figure 2 shows a typical curve of the relationship between inversion temperature and pressure. Figure 2 Inversion curve for nitrogen. Within the boundary of the curve, the Joule-Thomson effect is positive (ΔT < 0) and outside the boundary, negative (ΔT > 0). For points on the curve itself, the effect is equal to zero. The inversion curve separates those gaseous states between which the transitions lead to the cooling of the gas from those states of the gas in which the gas heats up. The values of the higher inversion temperatures (Ri,max, Figure 2) of a number of gases are given in Table 1. The Joule-Thomson effect characterized by small ΔT values with small pressure drops Δp is called the differential Joule-Thomson effect. With large pressure drops in the throttle, the temperature of the gas can change appreciably. For example on throttling from 200 atmospheres to 1 atmosphere at an initial temperature 17°C, the air cools 35°C. This total effect serves as the basis of most technical gas liquefaction processes. Landau, L. D., A. I. Akhiezer, and E. M. Lifshits. Kurs obshchei fiziki: Mekhanika i molekuliarnaia fizika. Moscow, 1965. Leontovich, M. A. Vvedenie v termodinamiku, 2nd ed. Moscow-Leningrad, 1952.